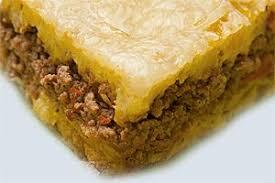 Pastelon de Amarillos - Yellow Plantain and Meat Pie - Tienditadepuertorico.com - Buy Puertorican Food Here!! over medium heat for 5 minutes. Set aside. 2 Preheat the oven to 350 F. Heat the oil and fry the plantain until golden brown. top and pour the eggs over all. Bake for 45 minutes, or until the eggs are set.